This page is part of a series on useful WordPress plugins. In this series, I’m reviewing WordPress plugins that I use on a regular or semi-regular basis. Some are go-to plugins that I install on every site, while others I grab whenever I need to accomplish a certain goal. These posts will be tagged “useful WordPress plugins”. To follow along, you can read the tag archive, or follow the tag feed. As always, your comments, thoughts, and questions are welcome. I’ve been with a number of hosts over the years, but I have been with DreamHost the longest. They recently rolled out DreamObjects, which is their version of cloud-based storage. I tried it out (the price was right), but really couldn’t see myself using it, until I discovered the DreamObjects Backup plugin by Ipstenu. Notice that it kindly informs you when your next backup is scheduled. Nice! As an added bonus, you don’t have to create those folders. 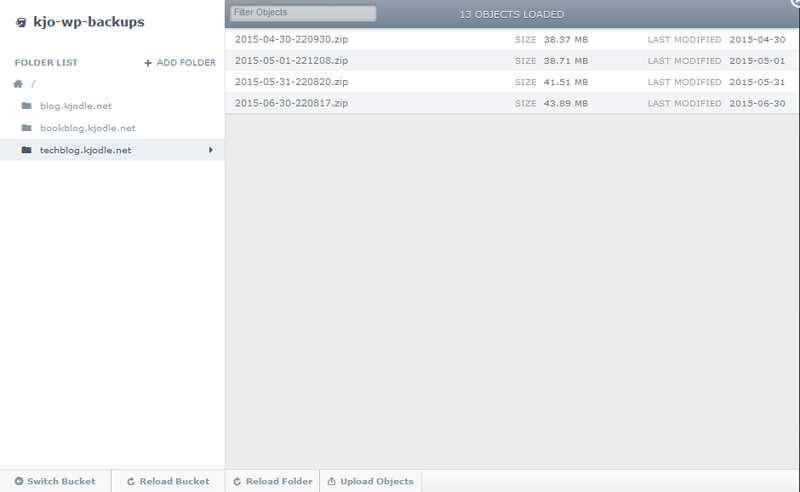 Just create the bucket and DreamObjects Backups will create a folder for each site you are using the plugin on. On the negative side, it doesn’t backup your .htaccess file or your wp-config.php file. But those are small and relatively easy to backup on a regular basis yourself, even just using FTP. Additionally, backups are limited to 2GB, which is an issue with PHP, not the plugin. 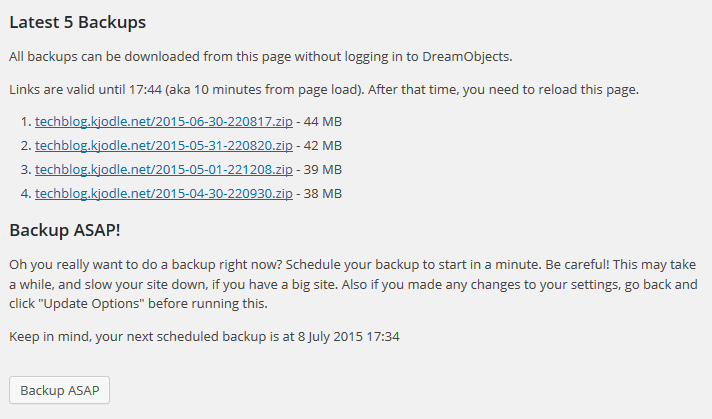 If you are using WordPress on DreamHost, this plugin makes sense. It just works—once you’ve set it up there’s nothing to fiddle with. You do your thing adding lots of great content, and it does its thing backing it up for you. As for cost, DreamHost is reasonable. I’m backing up several sites every month, retaining five backups for each one, and I’m spending around a dollar a month in storage. You really can’t beat that. Try it—I guarantee you’ll like it.